Escalators are a more frequent cause of injury than many people may think. An estimated ten thousand or more people are injured in the United States each year in an escalator accident. When accidents happen, it is usually when a store customer is getting on or off the staircase. Usually, it is due to a defective staircase or lack of adequate maintenance, or negligent maintenance, or a defective design. Another common cause of accidents is when the staircase is moving at an excessive speed, which can lead to serious injuries. If you are an Olympic athlete, then stepping on or off an escalator traveling at a very high speed most likely will not pose much of an issue for you. But for the rest of us, a fast-moving escalator can potentially pose a risk if injury. An eighty year old grandmother may lose her balance and fall when trying to get on or off the escalator if the staircase is moving too fast. Under the rules pertaining to premises liability, when a store knows or has reason to believe that its customers will be of all ages, it has a duty to make the premises safe for all customers. For this reason, escalator operators must be very careful to ensure that their escalators are working at a proper speed, that is slow enough for all people who visit their establishment. The design of the steps and the entrance and exit plates must be flush with the steps to avoid tripping. Often, an escalator will be moving too fast, or the entrance or exit plates will not be flush with the steps, as a result of loosened parts or debris in the path of the escalator. When an operator does not fix such defects or clean up such debris, an accident becomes unavoidable. Another frequent cause of accidents is getting trapped between two steps as they are closing together. Some escalators, as a result of defective design, are more prone to this type of accident. In such cases, the manufacturer of the escalator may be liable for your injuries. 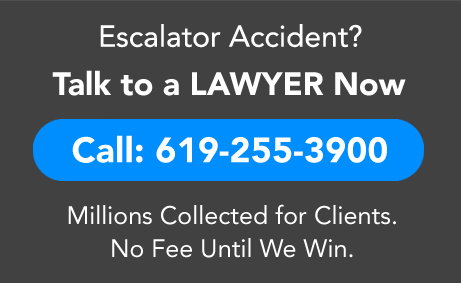 A San Diego escalator accident attorney can investigate the cause of the accident and determine whether the manufacturer is liable on a defective design theory, and help you obtain justice from all parties who should be responsible for your injuries. Safe operation of an escalator requires regular maintenance to ensure the staircase is working property and safely. When companies cut on escalator maintenance costs to increase profits, they fail to adequately maintain their escalators, which increases the likelihood that you might be injured in an escalator accident. Such failure to adequately maintain an escalator may constitute negligence maintenance, giving rise to a separate basis for liability, under which you may be able to hold the operator or store owner accountable for your injuries. Failure to properly maintain an escalator also frequently results in an escalator coming to a sudden stop while people are on the staircase. This can cause you to fall forward. Depending upon how many steps are underneath you, you may suffer a steep and hard fall, causing severe injuries. If you or a loved one has suffered a serious bodily injury as the result of an accident, a San Diego escalator accident lawyer at Injury Law Group can help you obtain payment for your medical bills as well as financial compensation for your pain and suffering.